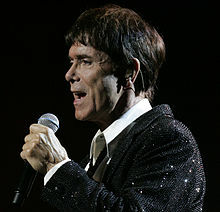 Sir Cliff Richard, OBE (born Harry Rodger Webb, 14 October 1940) is a British singer, musician and actor. He is the only male solo artist to have had number one singles in the 1950s, 1960s, 1970s, 1980s, and 1990s. In November 2013, Richard released his latest album, The Fabulous Rock 'n' Roll Songbook. This is his 100th album. Richard was born in Lucknow, India. In 1948 he and his British parents moved from India to England, first moving to Carshalton, Surrey, then to Waltham Cross, followed by Cheshunt, both in Hertfordshire. Richard began his music career in 1958 and is still performing. His name Richard comes from Little Richard. His backing group are The Shadows. He performed the United Kingdom entry at the Eurovision Song Contest in 1968 and in 1973. In 1980 Richard was given an OBE. In 1995, he became a Knight. This means that he has a 'Sir' in front of his name. A person is given a Knighthood by The Queen. Between 1960 and 1963 Richard presented The Cliff Richard Show. In 2008 a book that he wrote about his life so far, My Life My Way was published. It was also released as an audiobook. Richard is a devout Christian. He has never married. In August 2013, Richard's Berkshire home was searched by police over a claim of sexual assault on a boy aged under 16 in 1985. He was not arrested or charged. ↑ Hodgson, Claire (11 November 2013). "Sir Cliff Richard in numbers and quotes: Everything you need to know about 73-year-old Bachelor Boy". mirror. ↑ "Sir Cliff Richard 'prays for his enemies' and says there would be fewer wars if people were more spiritual". Mail Online. 25 September 2011. ↑ "Sir Cliff Richard's Berkshire property searched by police".